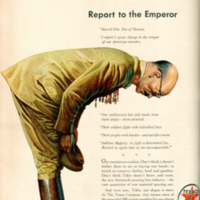 Chrysler Corporation advertisement; "It wasn't just dark...it was black as Tojo's heart!" 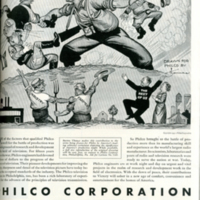 Philco Corporation advertisement; "He is our boy!" 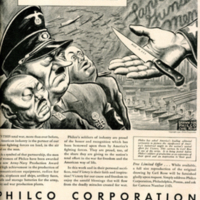 Texaco Company advertisement; "Report to the Emperor"
Philco Corporation advertisement; "Coming Events Cast Their Shadows." 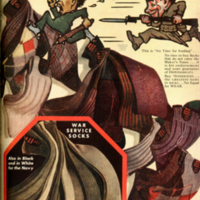 Interwoven Socks advertisement; "Time for some good Socks"
Philco Corporation advertisement; "Tanks, Guns, Men." 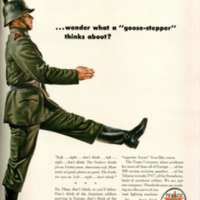 The Texaco Company advertisement; "...wonder what a "goose-stepper" thinks about?" 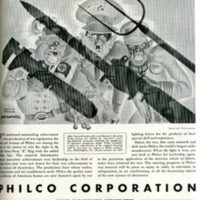 Philco Corporation advertisement; "One way to handle vandals!" 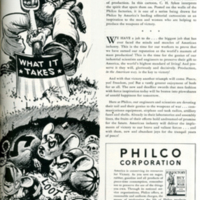 Philco Corporation advertisement; "Dig 'Em Out!" 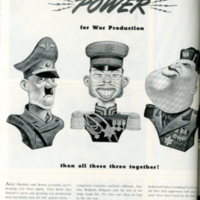 U.S. Electric Companies advertisement; "Uncle Sam has far more POWER for War production, than all these three together!"